You know how everyone's favorite part of the Star Wars franchise is the business about the taxation of trade routes in Episode One, The Phantom Menace? What if you got rid of all the other junk, like the lightsaber fights, the space battles and the Jedi stuff, and you just had end-to-end discussion and analysis of politics and money? It's hard to imagine that anyone could possibly handle such excitement, but then there's the "High Society" storyline from Cerebus to prove that it's definitely possible. Strap in, kids. If you don't know who Cerebus is (a very real possibility considering the series was last published over 10 years ago and never sold more than 40,000 copies of any individual issue), writer/artist Dave Sim's comic book, starring the titular angry, little, anthropomorphic aardvark, started out in 1977 as a take-off on Conan the Barbarian, before morphing into a far more complicated mythology involving everything from politics to religion, in a pre-planned run of 300 issues that ended with Cerebus' death. Known best for the thick "phone book" trade paperbacks that collected the series' multi-issue story arcs, the series garnered a great deal of critical and comic-industry acclaim, largely due to the impressive art, experimental creativity and Sim's role as an independent creator. However, he eventually sabotaged himself by expressing unpopular viewpoints both personally and in his comic, driving away fans and colleagues. The series petered out in the end, selling a fraction of the issues it did at its height, with readers questioning the quality of the final chapters. 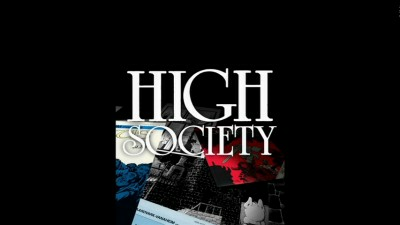 This DVD set goes back to the early days of Cerebus though, collecting the "High Society" run, from issue 26 to 50. It was in these issues, which see the one-time warrior work his way into politics, where the series first made its mark, as Sim wove a dense storyline of deceit and double-crossing, with Cerebus turning against his former boss, political big-wig Lord Julian (who looks and sounds like Groucho Marx) and runs for the office of prime minister of Iest. The story follows from Cerebus' introduction to Iest, his eventual campaign, the election and its aftermath, with a cast of supporting characters who work with and against him on his path to power. The plot points can be telegraphed at times, but they are interesting enough to stay on board. On this DVD set, Sim adds some new wrinkles, giving voice to his characters (with music and sound effects added in to complete the feel.) Sim's vocal takes on Cerebus, Lord Julian and Moon Roach are all rather impressive, delivering closely on what your reviewer imagined the characters to sound like, but his female characters sound awkward and cartoonish. Overall, the performance is solid, though the sound effects (especially the ones Sim reads) can be a bit over the top and the ever-present chanting monks can get to be a bit too much. Also a problem is the general presentation. Unlike motion comics, where the art is moved moderately to imitate animation, the camera is instead moved around the printed page here, from panel to panel, as Sim reads the parts. Oddly, only a small portion of the screen is used, creating a windowboxed effect, which decreases the impact of Sim's well-crafted art. A full widescreeen presentation would have let the comics shine, rather than being minimized like this, since the text of word balloons and captions remains in place, further limiting the visuals. There's a claustrophobic feel that doesn't play well on video, an odd choice that becomes odder when in later episodes the pages are composed in a widescreen aspect ratio, but the pages are displayed vertically, then turned 90 degrees when the art is zoomed in. If the pages were also included in a way that let viewers peruse them at their leisure, this might be fine, but as it is, this is a flawed presentation. The 25 issues of "High Society" (which run between 16 and 30 minutes each) are spread over eight DVDs, which are packaged into a gorgeous hardcover four-panel folder (with the phone book's iconic Sim/Gerhard cover art) with slots for each disc. The discs aren't really going anywhere, but many dislike the slot concept when it comes to disc storage. The discs have static full-frame menus, with options to play episodes and check out the extras. There are no audio options and no subtitles. The odd presentation aspect ratio aside, the scans of the comics look pretty nice, with clean lines, though you often see Moiré effect thanks to Sim's use of crosshatching and halftones in his art. Naturally, as Cerebus was a black and white comic, there's no color in this set. Compression artifacts are not an issue. The audio is presented in Dolby Digital 2.0 tracks that are, like the visuals, clear and consistent, with decent separation between Sim's voice, the music and the sound effects. Everything is center-balanced and of an appropriate volume, making for a very straightforward presentation. The extras take the form of editorials and letter columns from each issue, with the editorial read by publisher Deni Loubert (his now ex-wife) and the letters read by Sim. These are interesting to hear, especially when Sim makes note of certain info now available in retrospect (or when he occasionally stumbles, as there was apparently just one take on these tracks.) The issue though is actually the issue. As the content is read, the issue is flipped through on-screen, but in three-quarter profile. The issues include all the original ads and such, which would make them well worth checking out, but the presentation doesn't allow that, which is a bummer. At $40 SRP, this set isn't that much more expensive than the trade paperback version, though those give you a very different contact with the story. This presentation is mainly for the diehard Cerebus fan who always wanted to hear the characters come to life or casual readers intrigued by the concept, but who want a chance to passively experience Sim's creation, as a 500-page tome might be too daunting. Though the presentation is wanting, Sim's female voices are jokey at best and the story starts slow, "High Society" holds up as a story decades later, which is either a positive sign for Sim's craft or an awful sign for our world, as these political shenanigans remain wholly relevant. The only problem is, the elements that made Cerebus so unique as a comic, like the experimentation with format and the blending of comic art with prose, lose their impact on DVD.